The combination of power pack NF 45 and ionizing bar NFA was developed specifically for use on fast running machines. 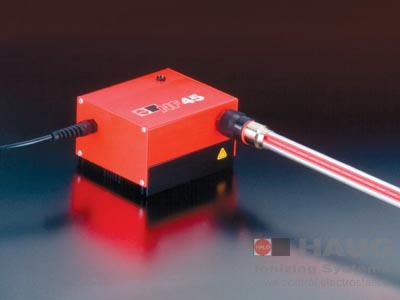 The power pack NF 45automatically adjusts the discharging frequency (400 – 800 Hz) to the connected bar length. The higher frequency of the power pack NF 45ensures a high decoupled current and therefore fast, even discharge of the material. Still, the ionizing bar NFA is absolutely safe to touch. The compact aluminum housing allows the NF 45 to be used in locations where space is at a premium. The ionzing bar NFA which is adapted to theNF 45 can be connected directly or using a connection cable. Only the ionizing bar NFA can be connected to any one NF 45. The functions of power pack NF 45 RLC are identical of those of power pack NF 45, but the NF 45 RLC is characterized by a different arrangement of the external ports. In addition to the signaling socket, an error message can be output. Following an overload (switch-off of high voltage), the NF 45 RLC automatically performs a readjustment. The power pack NF 45 / NF 45 RLC is supplied with a low voltage of 24 VAC/ 30 VDC. This required supply voltage can often be supplied directly from the machine. A series transformer with connection facility for up to five power packs. The NF 45 / NF 45 RLC is available as accessory for all customary mains voltages (230 VAC / 115 VAC). Due to its low weight, the power pack NF 45 / NF 45 RLC can be attached using the enclosed retaining plate, e.g. on swivel or robot arms. The ionizing bar NFA is connected to the unit using the proven, patented, gas-tight coaxial high-voltage connector system X-2000 NFA. The ionizing bar can be assembled without the need for tools. The operating status of the power pack is indicated by an LED (green = bar has been adjusted to the maximum power / orange = bar is adjusting itself to optimum power). Regular use of HAUG special cleaning agent SRM 1 and cleaning kit RS 2will ensure consistently high efficiency of the ionizing bar NFA.